It appears that there have been some gross inaccuracies and misunderstandings that have led scientists to accept an oversimplified model of human entry into America via the Bering land bridge during the height of the last ice age. No consideration to the possibility that ocean crossings played a significant part in the populating of the Americas, has been given. Recent studies of the tool kits of the first Americans suggest an entry from Spain and not from Siberia. Not only this, but paleolithic Caucasian genes appear to form the basal layer of the genetic makeup of many native Americans, helping to confirm a trans-Atlantic entry into Central America between 18,000 and 12,000 years ago. Recent discoveries of three 15,000 year old Cro magnon man skeletons in an underwater cave in the Bahamas suggests that the above is true and correct. This was not the only catastrophic rise in sea level that early man has had to deal with, there were others. It was after these events that we find the survivors taking an interest in swamp agriculture around lakes and on highland plateaus without fear of inundation. It appears that archaeologists may have mistaken this regrouping of man after the final floods as the beginning of agriculture and civilization. Aztec and Toltec history identifies that 17,608 years ago was the beginning of "The Age of the First Sun" or the "Age of White Haired Giants", or in Inca history - the Age of Viracochas - the “White and Bearded Gods”. According to European archaeology, Cro Magnon man was quite tall, had pale skin, blonde hair and was capable of growing beards. It sounds to me like cultures on either side of the Atlantic are describing the same breed of man. Archaeological finds in America appear to confirm the existence of very tall people being the base layer of the Native American cultures. A skeleton estimated as being 10,000 years old was found in the ‘tomb of Palli Aike' in Tierra del Fuego in 1969-70 and has been identified as Cro-Magnon, which indicates that these people also spread to South America. In the book, The Natural and Aboriginal History of Tennessee, author John Haywood describes; "very large" bones in stone graves found in Williamson County, Tennessee, in 1821. In White County, Tennessee, an "ancient fortification" contained skeletons of gigantic stature averaging at least 7 feet in length. In February and June of 1931, large skeletons were found in the Humboldt lake bed near Lovelock, Nevada. The first of these two skeletons found appeared to have been wrapped in a gum-covered fabric similar to the Egyptian manner. The second skeleton was almost 7 feet long. (Review - Miner, June 19, 1931). Just as black haired Greeks had an earlier past of taller blonde and red haired people (the Titans), so did the Amerindians. 13,600 years ago In Aztec legends, was the beginning of the Age of the Second Sun - the “Golden Age” and is remembered in Incan legends as the “Age of Giants”. This Age lasted 4,010 years, it began with the Biblical and Sumerian Great Flood, followed by the Deluge and ended with a calamity involving the Wind Serpent. The demise of Atlantis was somewhere in the middle of this. European legends from Ireland, Brittany, Spain and North Africa and Egypt talk of their legendary homeland being on the other side of the Atlantic Ocean, and in some legends it was called Atlantis. This map shows the position of the coastline during the height of the last ice age about 18,000 years ago. 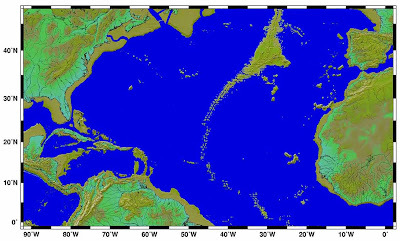 Seafloor topography clearly reveals the island of Atlantis in the Mid Atlantic. This area was pushed up to the ocean surface during the height of the last ice age as a reaction to the weight of over 3 km of ice on the poles, which depressed the crust in the Polar regions and caused weak areas of the the crust in mid lattitudes to distend outwards as the planet attempted to find an equilibrium. This effect would not be noticed on the continents as their thickness of 30 km or more would resist distortion, but the7-10km thin oceanic floors, especially the Mid Atlantic ridge where a seam of magma reaches the surface, would display the greatest amount of distortion, forcing the seafloor to rise a correspondingly similar distance to the depression at the poles - that is 2-3km. Today we are likely to witness a similar situation with Iceland - another island on the mid Atlantic ridge. As global warming continues to melt the ice at the poles, Iceland too, risks a sudden collapse under the surface of the ocean. It is no coincidence that many Central American place names are also derived from the fabled city of Atlantis. Aztlan, Azatlan, Atlanta, Tlan, Tolan, Tulan, and Tenochtitlan are all linguistically similar. The people of these cities would most likely have been descendants of the survivors of Atlantis. The Grand Bahama Banks - a shallow area of sea that 10,000 years ago would have been an island as big as Ireland and appears to have had trading ports around its perimeter. So far 60 sites have been found exhibiting remnants of buildings and ring structures. When comparing Platos story to this area it all fitted except for talk of horses and elephants in the city. I then looked up mammal extinctions in North America, to find that Mastodons and horses became extinct approximately 11,000 years ago! This correlates perfectly with the Clovis hunters and the time of Atlantis. Archaeological evidence shows that the Clovis people multiplied and spread across North America from the Gulf of Mexico about 13,000 years ago. This period abruptly ended with the demise of the megafauna of North America along with end of the Clovis people. According to the Aztecs, 7,590 B.C. or 9,500 years ago was the beginning of the Age of the Third Sun also called the“Age of the Red Haired People. These people were the survivors of the second age who had come by ship from the east to the New World, settling in the area he called Botonchan; they encountered there giants who also survived the second age, and became enslaved by them. Not only did the Age of Red heads end in America and Begin in Europe at this time, but it also marks the massive genetic bottleneck in East Asia when the Thais, Tibetans, Tlingit, Haida and Hawaiians dispersed from the Taiwanese people. Many people seem to think that Celts influenced American culture and ancient petroglyphs and megalithic monuments may seem to suggest this, but what one is seeing here is a dispersal of culture not to America, but from America. After the final sea level rises 6,000 years ago, wiping the Bahama Banks clean of any civilization, there was a major shift in world populations. Remnants of this culture of Red Heads went their separate ways.The Celts took the Gulf stream back to their ancestral homeland of Europe, wheras the Anasazi, Hopi, Zuni, Algonquian and Auracano, just to name a few remained in mainland America and began to mix with incoming Asians who had suffered a similar catastrophe of Sea level rises on the East Asian coastline. There are also suggestions that the Celts were in New Zealand before the Maori. This is not strictly true, they too along with the Red Heads of Rapa nui were also fragments of the Age of the Red Heads in America. 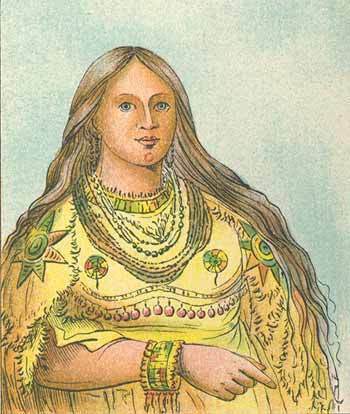 The Picts of Scotland were probably from a similar tribe to the the Tattooed Red Heads of the Pacific. It appears that Cro Magnon man was much more than a dirty unshaven bloodthirsty barbaric troglodite who hunted animals and dragged women around by the hair. It seems that there was once a highly sophistocated civilization that influenced many cultures around the world before it was destroyed by the hand of nature. Sophisticated Cave Men: DNA Fully Modern!